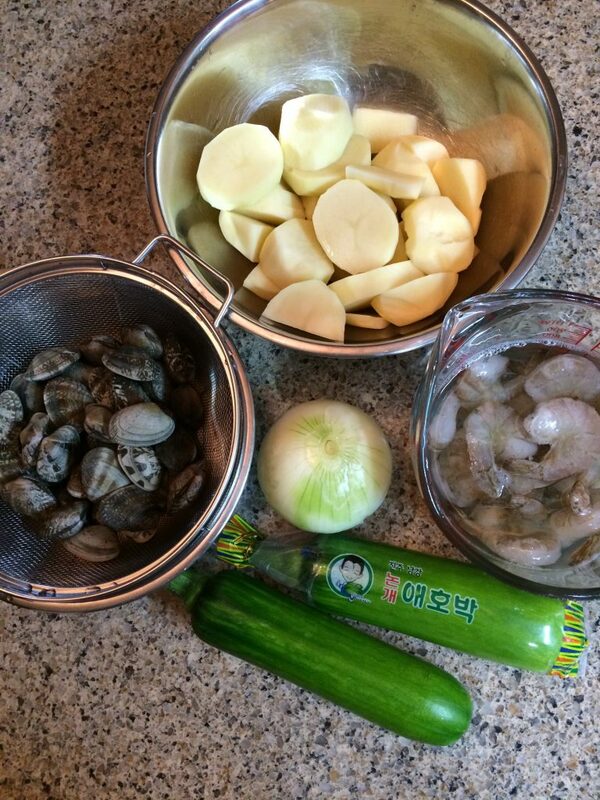 Gather the main ingredients. 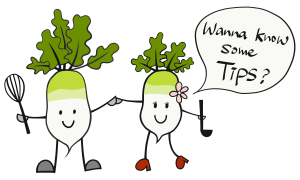 Then read the tips found here. 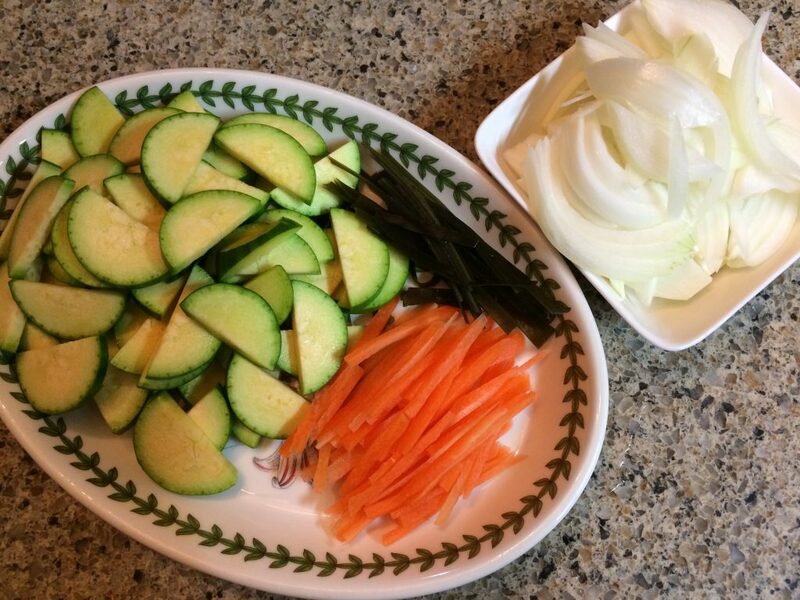 Cut the vegetables and set a side. 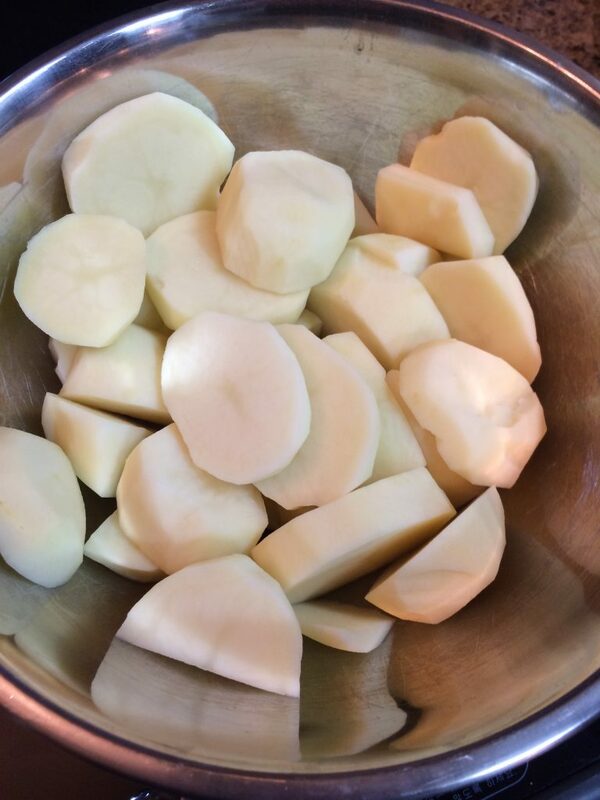 Peel and cut potatoes and set a side. 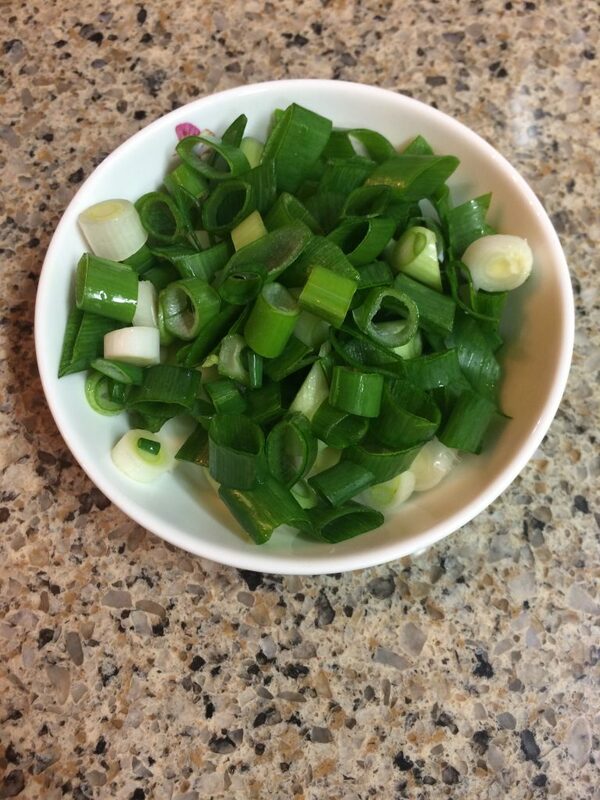 Slice green onions, and set a side. 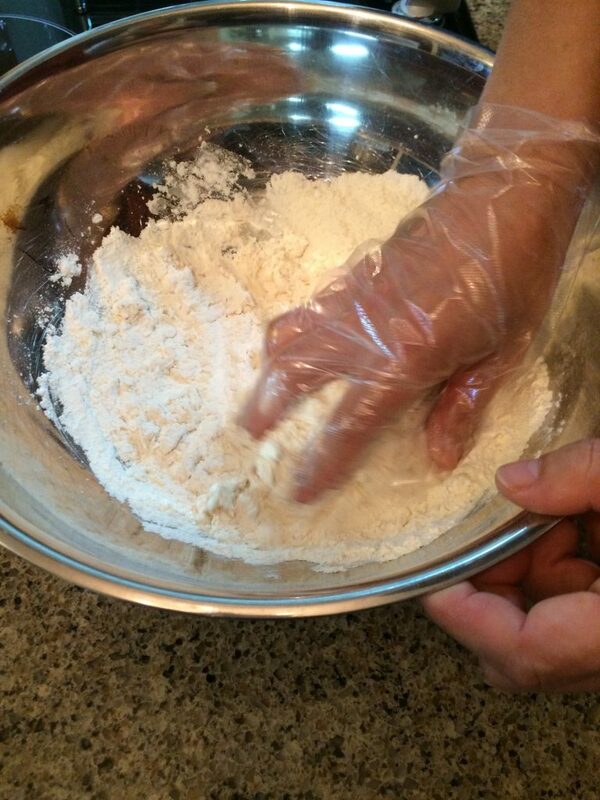 Measure the flour and put in a mixing bowl. 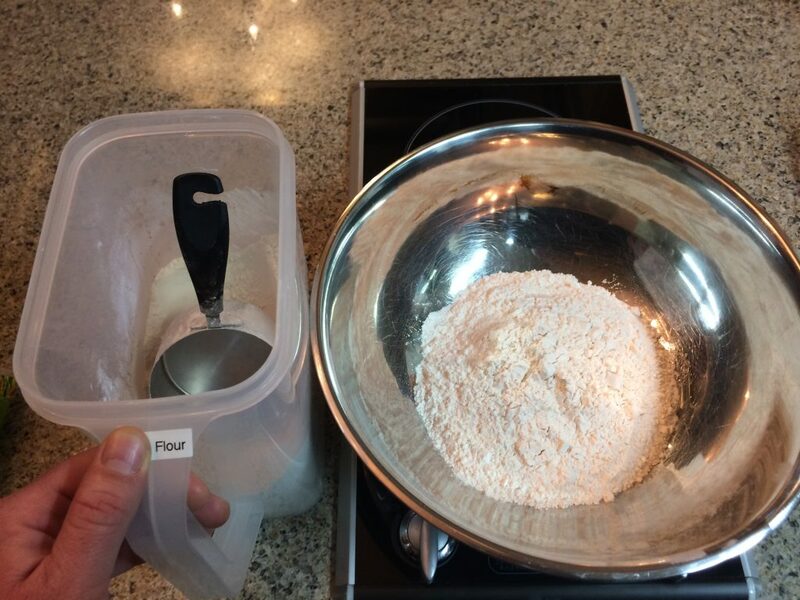 Add water to the flour in small amounts. 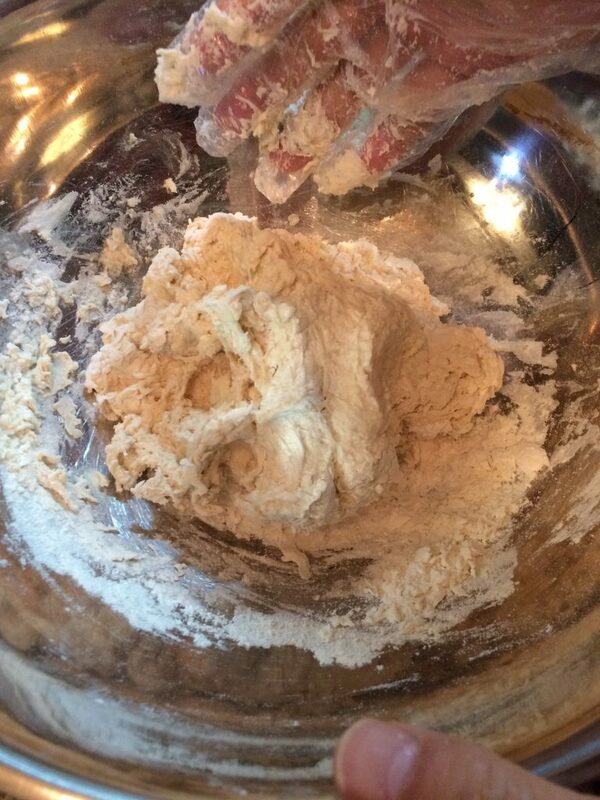 Use about 1/4 of the liquid at a time, and each time kneed the water into the flour. 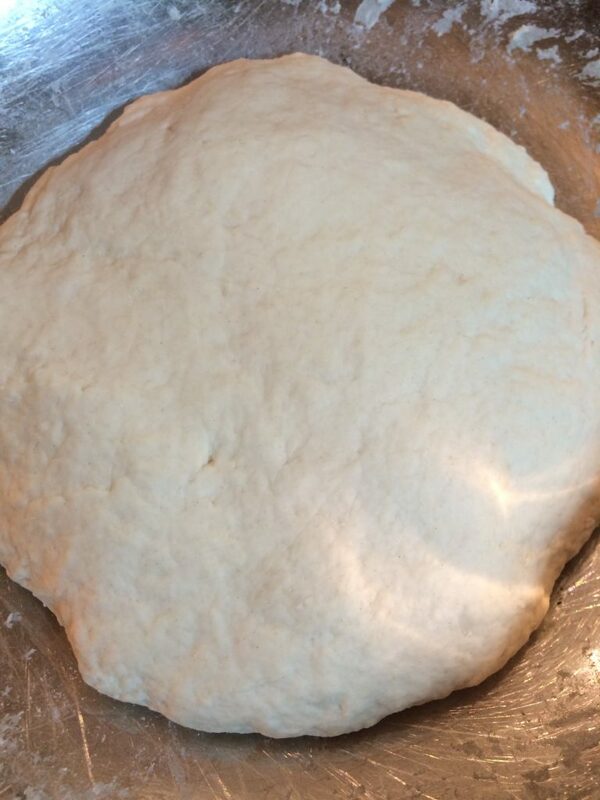 When the dough looks like a sticky ball, knead the dough for about 5 minutes until it is uniformly smooth. Once a uniform smoothness is achieved, stop kneading the dough, and transfer it to a plastic bag. 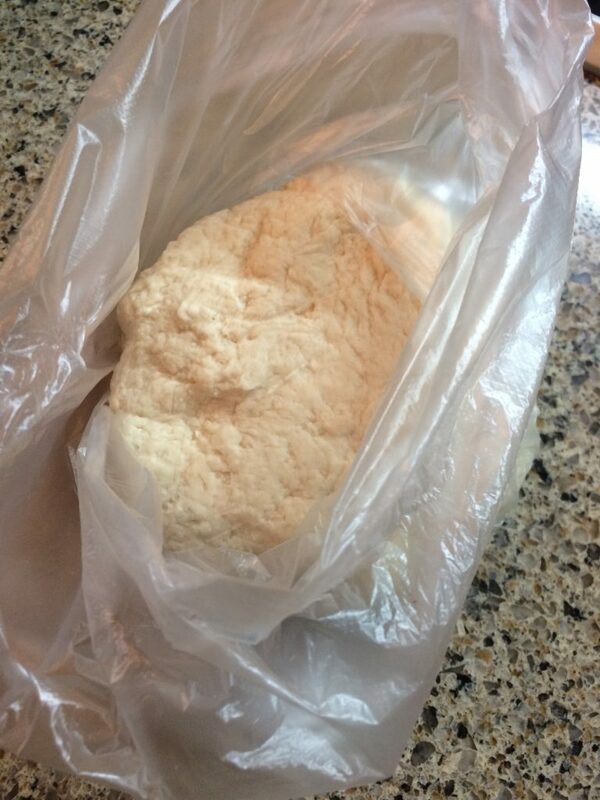 Place the bag of dough in the refrigerator until its time to use. This is an important step as the dough needs to be cooled. 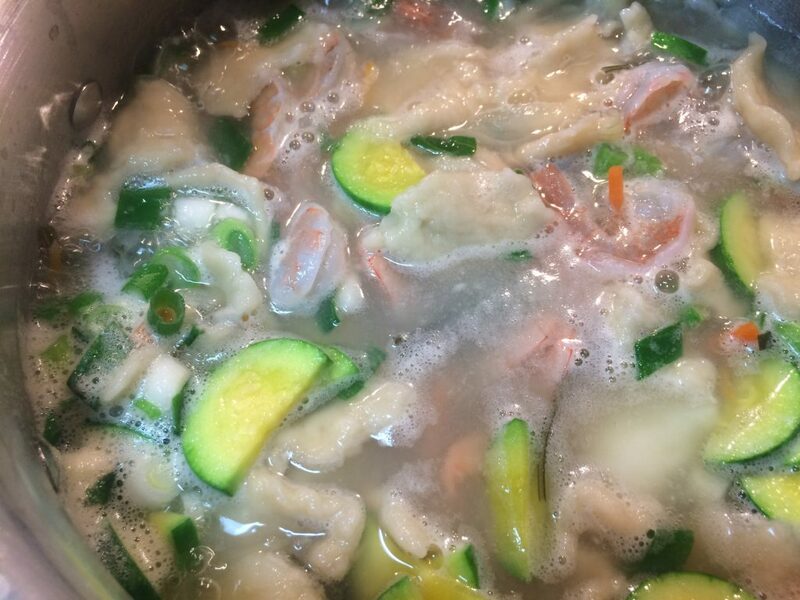 Cooling the dough improves the resulting texture of the dumplings. 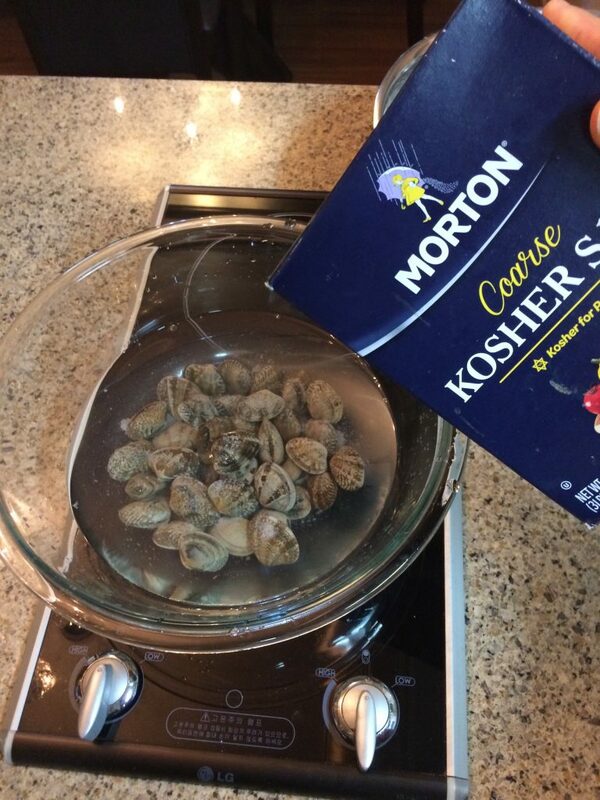 Salt the clams with about a tbsp of salt. 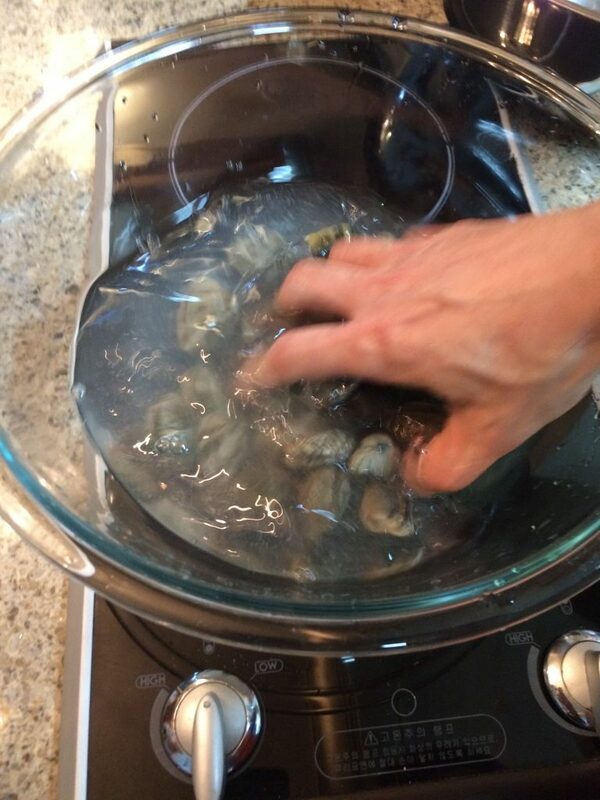 Let the clams sit for about 5 minutes in the salted water. During this time the clams will become angry and start to spit out the mud and sand they have inside and the water will become very dirty. Dump the water out, and refill with fresh water. 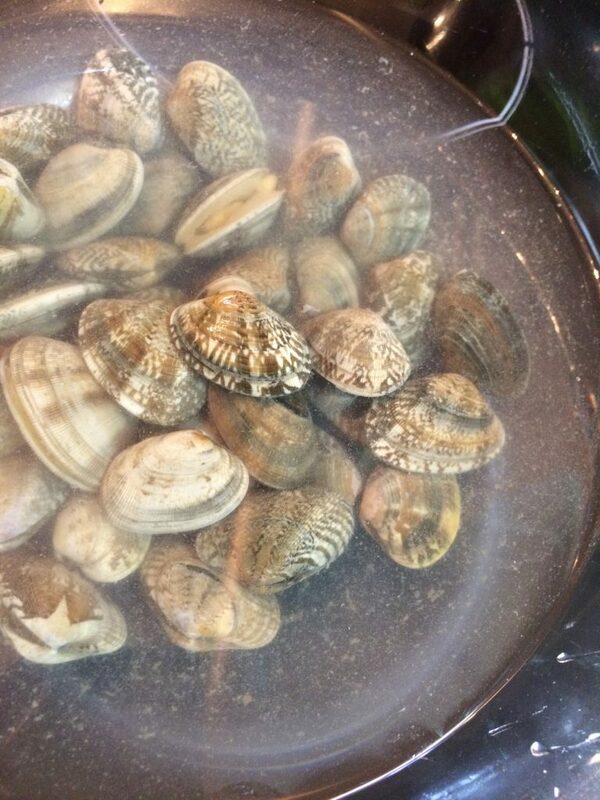 Let the clams sit in the fresh water for another 5 minutes. They will continue to spit out the garbage that you dont want. Finally, wash and rinse the clams under running water. 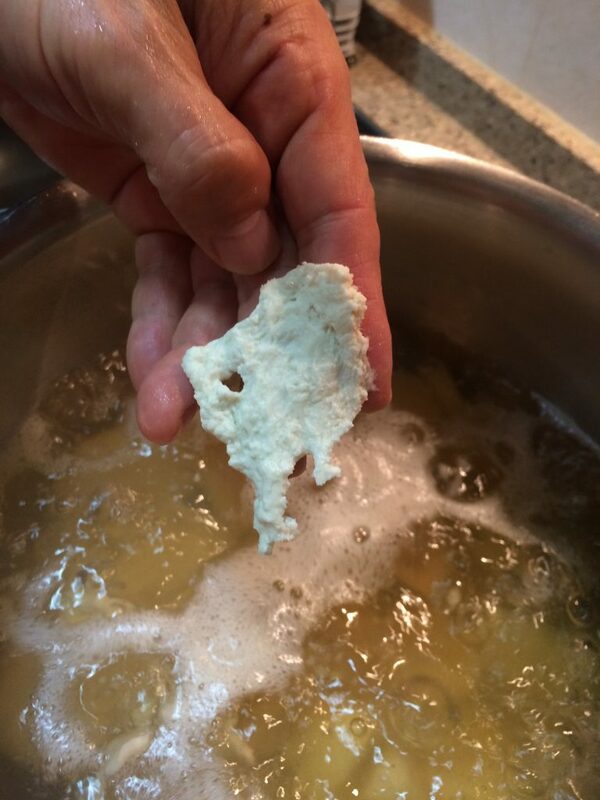 Wash, peel, and devein the shrimp. 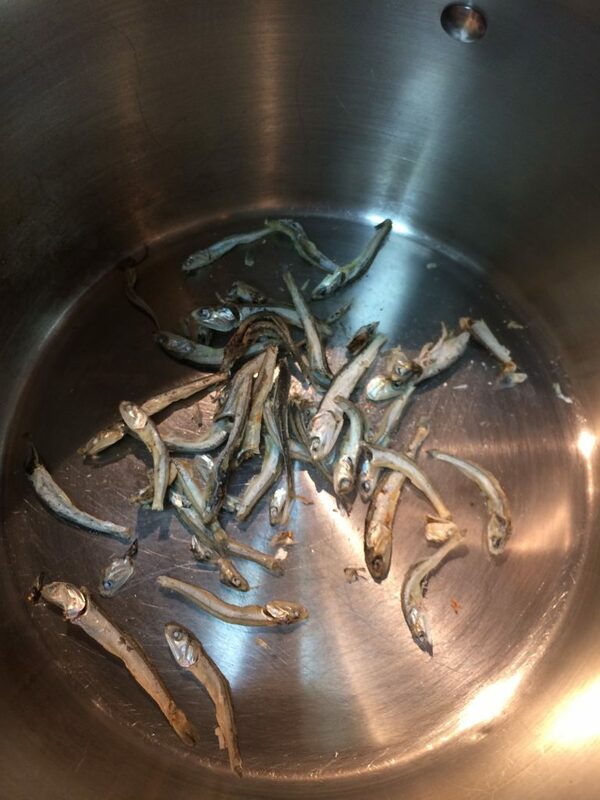 Prepare the dashi by soaking about 20 anchovies in 3 1/2 quarts (3.3 liters) of water. 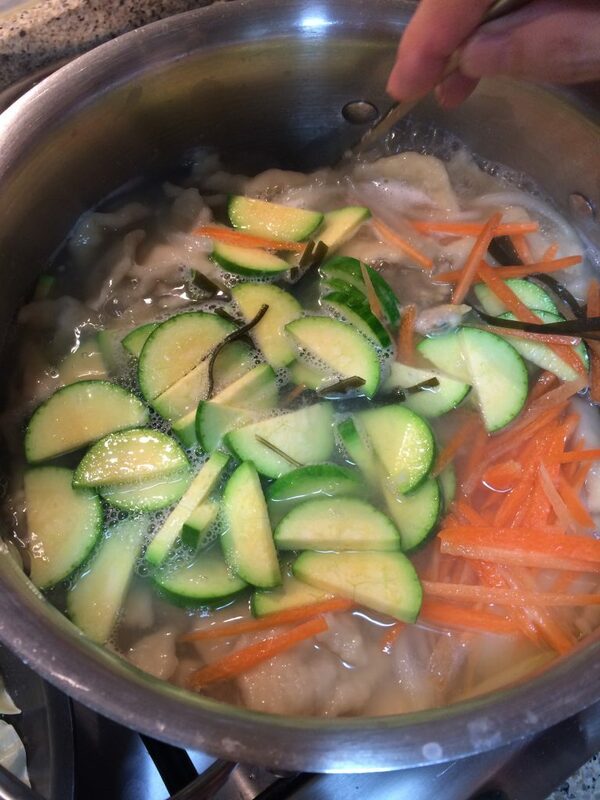 Add 4 pieces of kombu to the anchovies. 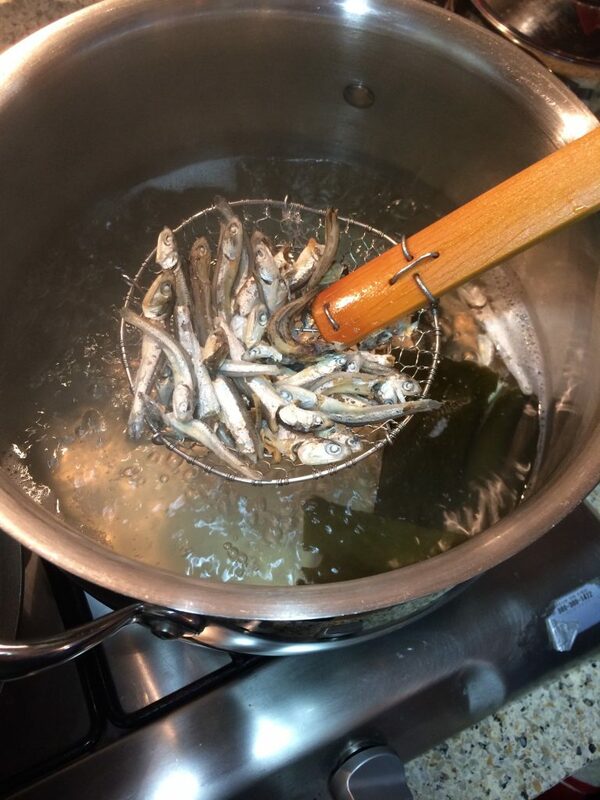 Soak the anchovies and kombu for 20 minutes. 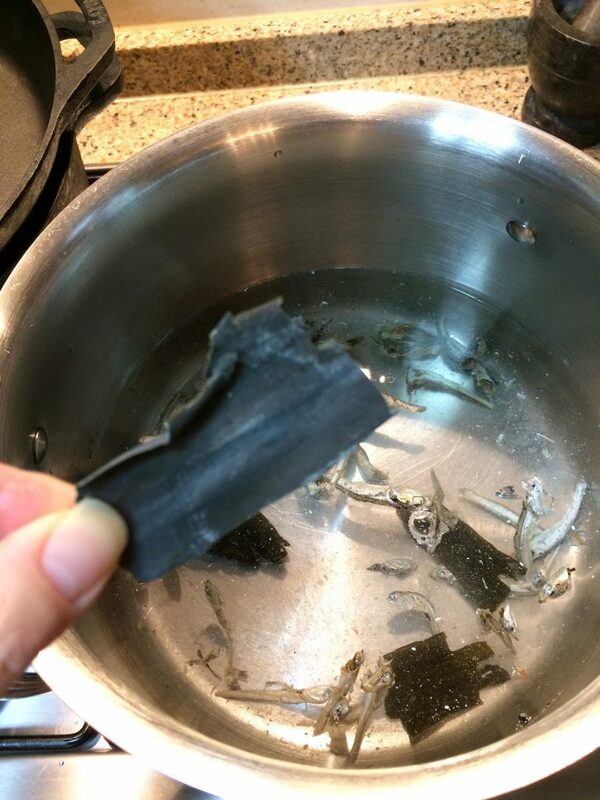 Boil the anchovies and kombu for 10 minutes then remove the anchovies and kombu. 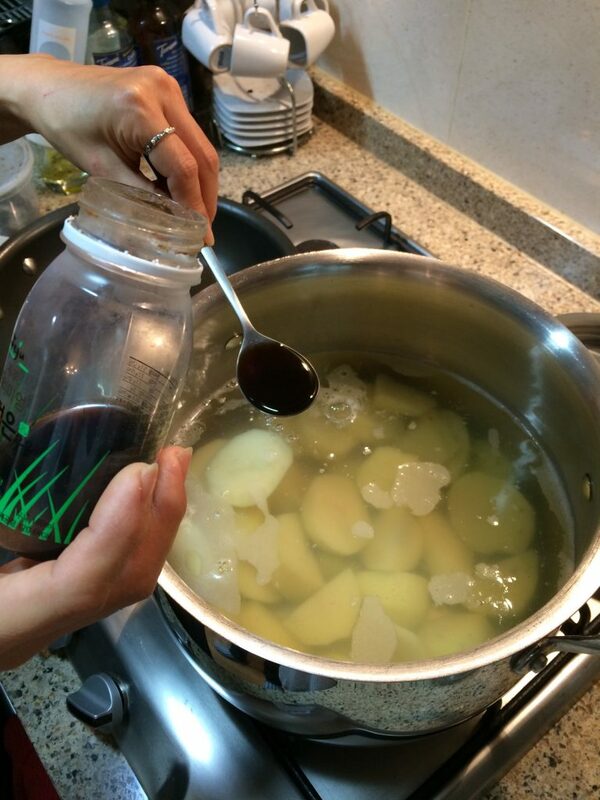 Add the potatoes to the dashi water. Add soy sauce to the stew. Tear chunks of dough off the dough ball and add the chunks to the stew. 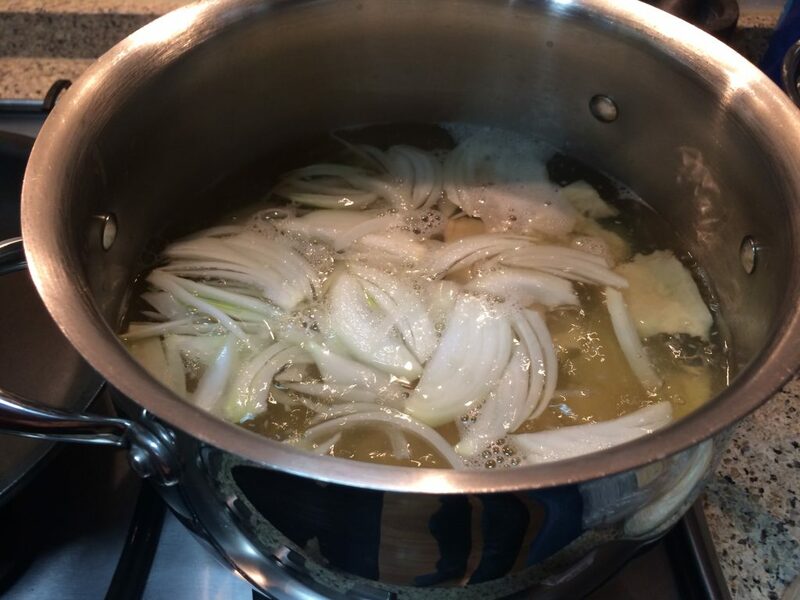 After the stew starts to boil add onions to the stew. 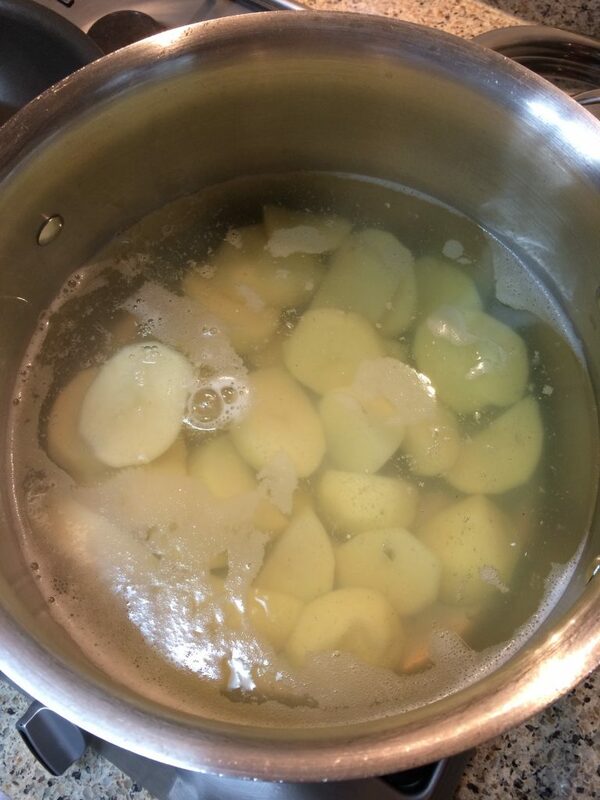 After the onions have boiled 5 minutes. 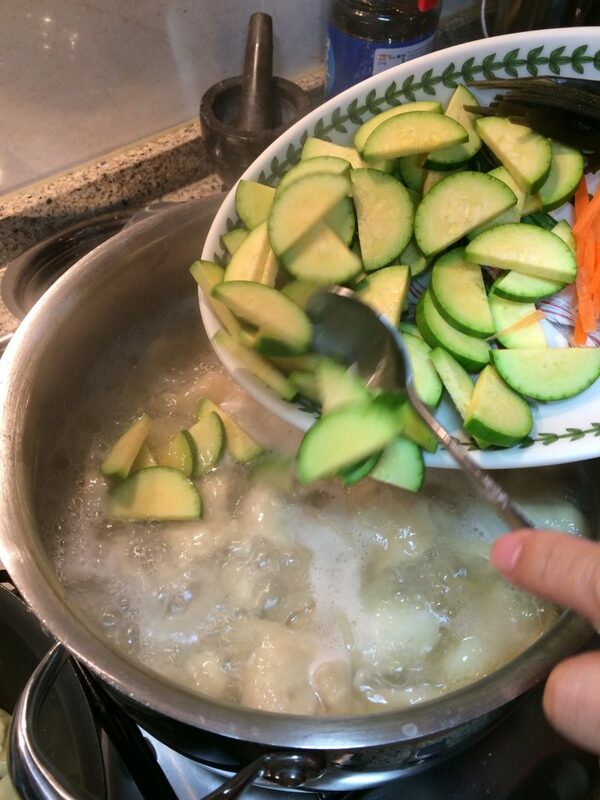 Add zucchini to the stew. Immediately following zucchini add carrots to the stew. 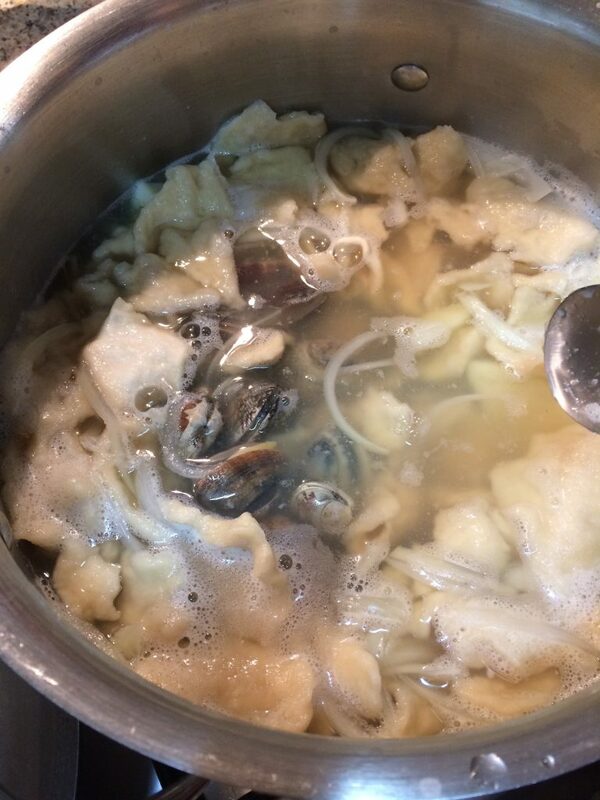 After about 3 minutes add clams to the stew. 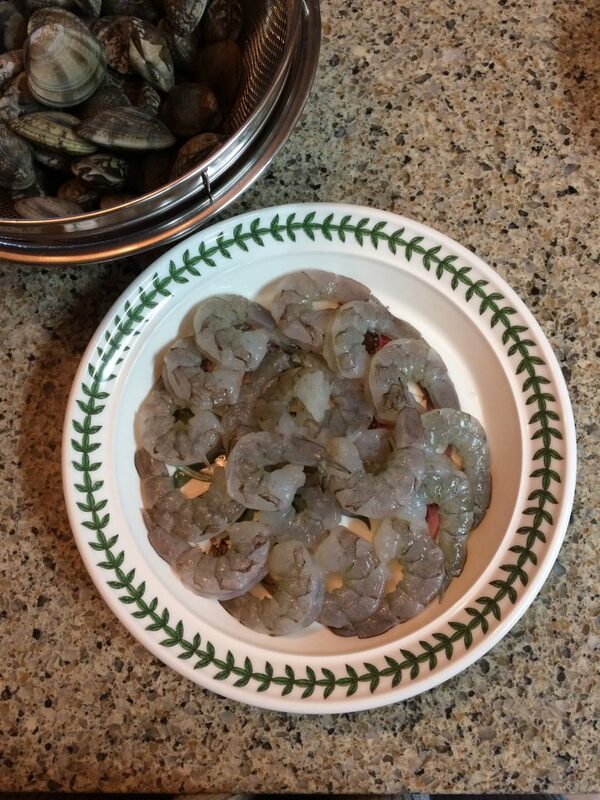 After about 3 minutes, turn heat down to low and add shrimp. After one minute, turn off heat. 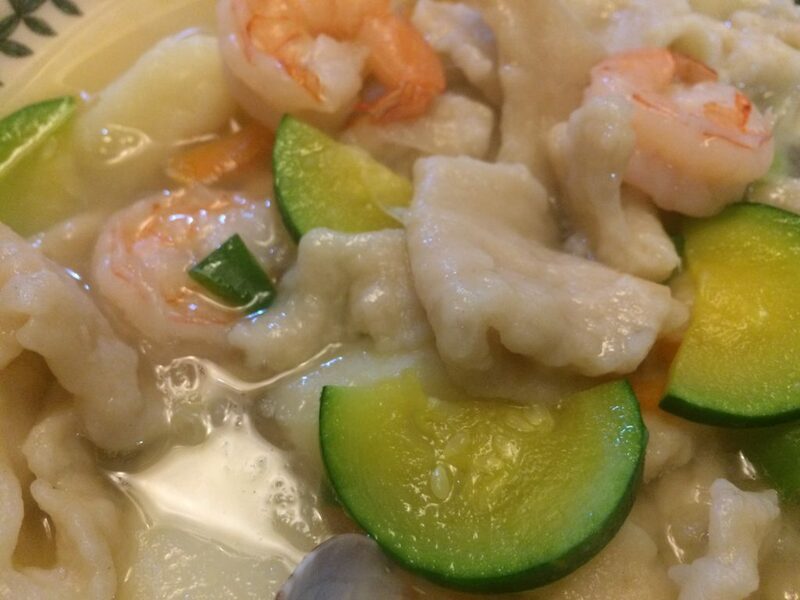 Shrimp will continue to cook. 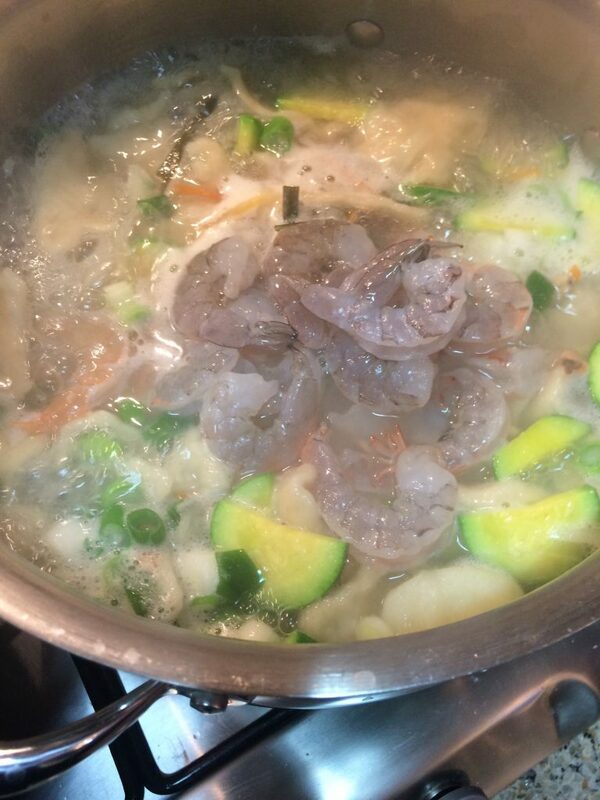 When shrimp are pink the sujebi is done. 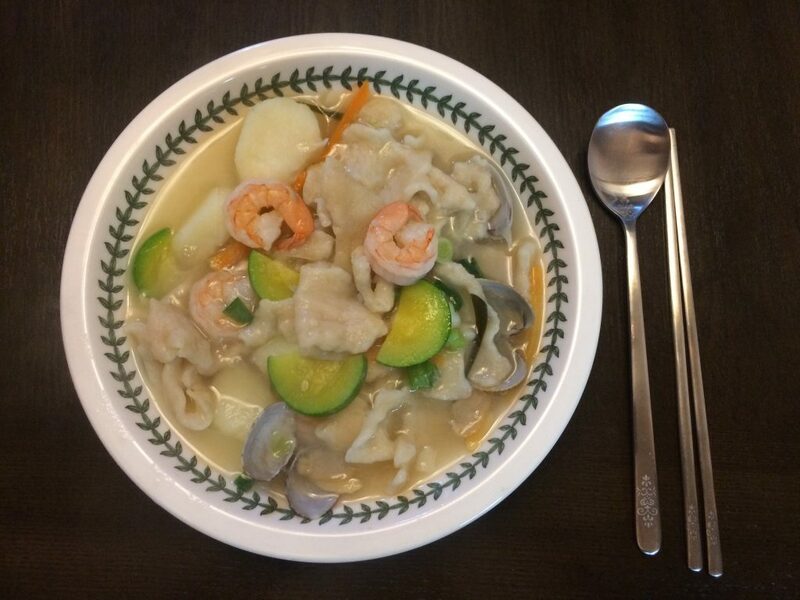 Serve immediately to prevent overcooking the seafood.